Sam Sadesh, the lead actor in 'Koothara', an upcoming malayalam movie directed by Sreenath Rajendran is all set to make a dream debut which also features Asif Ali, Sunny Wayne, N.Manu and Vineeth Sreenivasan in prominent roles. It is young director Sreenath Rajendran's second outing in malayalam after giving a promising start with 'Second Show'. Sam Sadesh might be on cloud nine after making an entry in tinsel town with 'Koothara', an upcoming movie from the hands of Sreenath Rajendran. The title seems to be weird but comparatively better compared with the names of those bejeweled in the past. If looking forward to know what the term means, 'Koothara' is an urban word which stands for 'cultureless', 'country fellow' etc. Sreenath Rajendran who stepped into the glamorous world of entertainment with his directorial debut 'Second Show', not much was expected from the audience rather than keeping an eye on Dulquer Salmaan. The movie proved to be a hit giving handful of opportunities for Dulquer Salmaan, Sunny Wayne and Gauthami. Made with a budget of Rs 1.3 Crore, the movie settled with Rs 10. 56 Crores at Box Office. Getting high applause for his first movie, Sreenath is gearing up for his second venture with a set of youngsters in front and back of camera. Scripted by Vini Viswa Lal, 'Koothara' will have new comer Sam Sadash as the hero which will also have Asif Ali, Sunny Wayne, N.Manu and Vineeth Srenviasan donning prominent roles. With location set at the picturesque island of Lakshadweep, the movie would tell the romantic story along with the life and friendship of new generation youngsters residing in Kochi. It would be the best opportunity for Manu to show his acting talent on screen after appearing in Tournament and Rose Guitarinal. 'Second Show' was such a classy movie which got praise for its quality and honest efforts effort put forward by a team of youngsters. 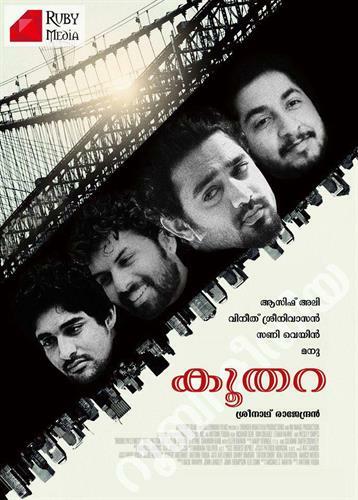 It was an attempt to redefine the pattern of making movies in malayalam. To be followed, Sreenath would like to keep the same pace with Koothara which is expected to start rolling soon. Let it be a stepping stone for young Sam Sadesh to get into the big league with his acting debut.